The following speech was delivered by City of Cape Town Executive Mayor, Patricia de Lille, at the 2016 Mayoral Awards held at the Cape Town Stadium last night, 28 May 2016. Good evening, goeie naand, molweni, as salaam alaikum, shalom. We take great pride in the determination and commitment of our staff. The City of Cape Town is not some lifeless and cold concept. It is a living, breathing organisation brought to life by the work of 27 000 people.Those are 27 000 different skill sets, personalities and strengths. As the Mayor, I value the work done by each and every person who works to make their great city what is increasingly being known for being the best-run metropolitan municipality in the country. From my own experience I know about the sacrifices that we are expected to make as public servants. I know about the sense of urgency that you have to work with. I understand the pressure that you are under not to make mistakes and disappoint the residents of our city. But you have prioritised honouring your city, its people and by extension your country, and those who sacrificed long between the dawn of democracy. Public service is not for the fainthearted and tonight we gather to celebrate those of you who have gone over and above the call of duty. An example which comes to mind is VIP protector Nurr Perrin who recently put his life on the line to protect the City’s Mayoral Committee Member for Social Development and Early Childhood Development, Councillor Suzette Little, when they were accosted by three armed assailants. We salute him for his bravery. Every day I can see the evidence of the hard work that is being done. When we drew up the Integrated Development Plan in 2011 we set out to implement 294 initiatives after extensive public participation. We have already implemented 97% of those and we have 13 months left until the deadline for completion which is June 2017. On behalf of the residents of Cape Town, I want to thank all the staff from the bottom of heart. Cities have unlimited potential and Cape Town is increasingly being recognised internationally as a city which pushes the boundaries of traditional governance. 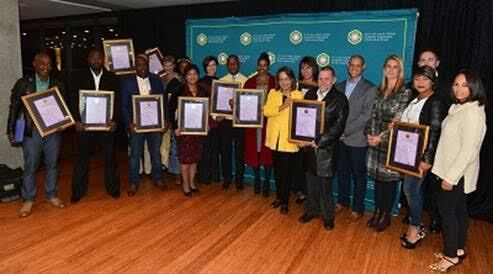 In December 2015, the City of Cape Town’s Water Conservation and Water Demand Management (WCWDM) Programme was announced as the winner in the Adaptation Implementation category in the 2015 C40 Cities Awards in Paris. In April 2016 the City of Cape Town was named the best metro for financial management by Ratings Afrika, based on a survey of all South African metros. This month, the City’s all-female road repair team won the award for the most innovative women’s programme at the national Women in Construction Awards. This week we were selected to join the100 Resilient Cities (100RC) Programme which seeks to find 100 cities across the globe that are ready to build resilience to social, economic and physical challenges faced by urban environments. These are just some of the awards which we have received, but the list is quite extensive. These are the fruits of your labour. Human condition appears to be of such a nature that we notice mistakes and defects before we acknowledge and celebrate that which is good and right. This administration fell into that trap, but since two years ago we have begun to try and turn that tide. We received feedback from our Employee Survey, Siyamamela (we are listening), which found that staff felt as if they weren’t being acknowledged for their achievements. And so the Mayoral Awards was implemented. Last year we acknowledged the outstanding achievements and contributions by staff towards our five strategic pillars. A well-run, caring, opportunity, safe and inclusive city. We celebrated ground-breaking work in innovation and sustainability. This year, we adapted the Recognition and Rewards Policy to include more winners and there will be 13 recipients of Mayoral Awards here this evening. This is almost three times the number of winners we had last year. I look forward to meeting and thanking each of the winners here tonight personally. We are nearing the end of this term. We have turned failures into lessons, but garnered even more achievements. We have exemplified the true meaning of making progress possible, together. It has been an honour to lead this magnificent team, together with the City Manager and it’s a privilege to celebrate your successes here tonight.